In the last decades subculture has become very important, especially in Berlin where it developed to become part of the city’s identity. The subculture includes alternative cultural practices and artistic expressions that are different to the imposed rules of conventional society. In the late 80s that different subculture began to grow. The fall of the Berlin Wall in 1989 made it also possible that these alternative practices could develop further. There were many empty spaces (buildings, garages, warehouses) which became occupied by people from around the world that were looking for something new in their lives. In this way, Tacheles Arthouse became the protagonist. 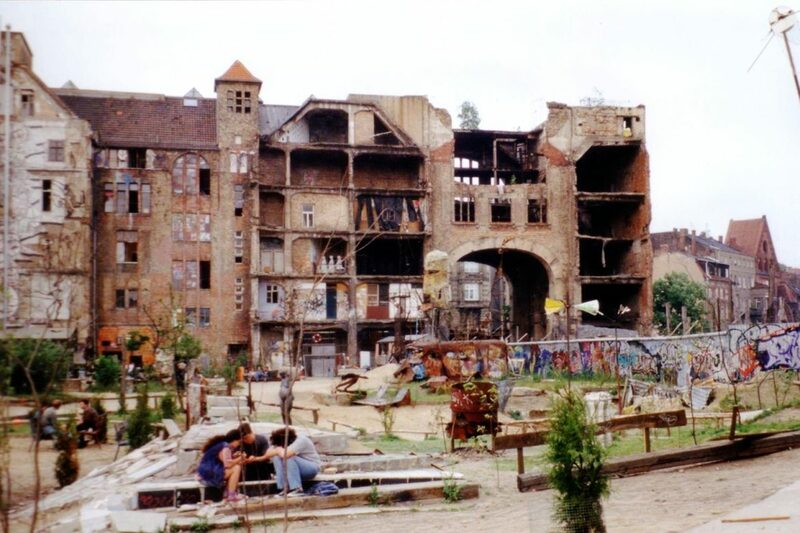 The Tacheles Arthouse was originally occupied on the 13th of February 1990 by a community of artists and as a result it became the centre of mordern art in Berlin. The Tacheles Arthouse has now a key role in the history of Berlin’s underground art. For over 20 years it hosted more than 500 artists around the world. Every artist had something in common; to create “art from and for all”, art that involved in a social and political way and has its origin in a creativity that needed to be released. It was here in the Tacheles where an impressed Jochen Hummel first encountered Tim Roeloffs. Jochen’s fascination with Tim’s art was the initial inspriation for him some years later to open Berlin Affordable Art. The closing of the Tacheles in 2012 further accelerated Jochen’s desire to collarborate with Tim. A new space was required, its intention to preserve this subculture, and once again showcase the work of all these great artists who had lost their “home”. Klassenfeind Gallery opened its doors for the first time in June 2015. and was open until its closing in March 2017. A gallery that was different to all the others, that wanted to revive the art and subculture of Berlin. A place where people were able to collect experiences, not objects. Therefore, to us it was important, that our visitors could have fun with the art, meet the artists and speak with them, and that they could also bring home unique art from Berlin for an affordable price. For that reason we wanted to continue with the philosophy: “art from and for all”.